Words of Wisdom from Dr. Martin Luther King, Jr. 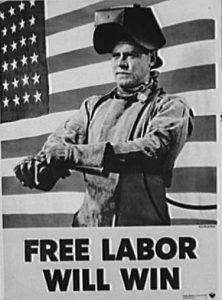 Written by, Tony Mussari, Sr.
On this the first Monday in September, we take time to celebrate American workers. We have been doing it in America since 1882. 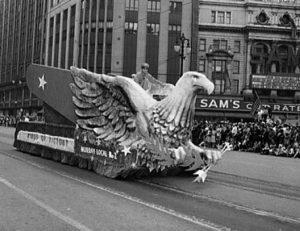 In 1884, it became a federal holiday. On this special day, Kitch and I thought it might be a good idea to share some positive thoughts about the day and the men and women it is designed to honor. To do this we will include some priceless pictures we found in the collection of the Library of Congress. The poetry of Edgar Guest reflects the American spirit and work ethic that made America great! His optimism is something we all need to hear during these difficult times. That "cannot be done," and you’ll do it. It is only through labor and painful effort, by grim energy and resolute courage that we move on to better things. What you will imagine, you will think, and what you think you will become. Whether the job be big or small, do it well or not at all. Once a job is first begun, never leave it until it’s done. Thank you, Johnny Ferko for this wise advice. 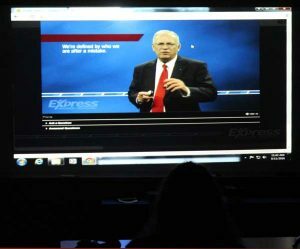 On a beautiful August morning, our Face of America journey took us to the McCann School of Business in Dickson City, PA. We went there to participate in a webinar featuring Jack Smalley, the director of HR Learning and Development for Express Employment Professionals. 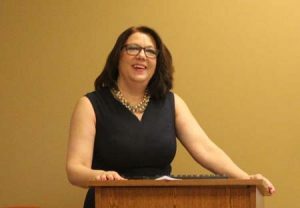 The event was organized by Amy Clegg and her staff at the Express Pros office in Scranton. 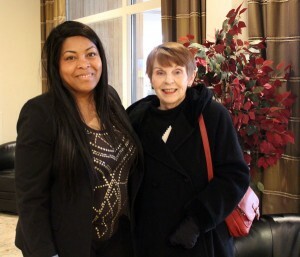 When we arrived, Brittany Pagnotti, Rameika Jones and Nikki Schake were attending to all the little details that would make the event a success. In our opinion, the venue was perfect. The atmosphere was welcoming. The food was delicious, and the sense of community was genuine. It has always been our pleasure to celebrate the accomplishments of Amy Clegg and her team, but this time she turned the tables on us with an announcement that took us by surprise. By nature, Amy is a giving person. She likes to help others get ahead. On this special occasion, she introduced Alexis Shotwell to the audience. Alexis is a student at the McCann School of Business. She wants to specialize in early childhood education. 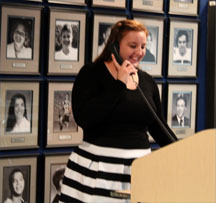 When Alexis came to the front of the room, Amy told the audience that Alexis would receive the first annual Dr. Tony and Mrs. Kitch Mussari Leadership Scholarship. The moment belonged to Alexis. The surprise belonged to Kitch and me. No words can accurately describe the expression of delight on Alexis’s face, and the feeling of gratitude in our hearts for this honor. Being a good listener is central to employee engagement, retention and productivity. Patricia L. Camayd is the Business Manager for Oliver Price & Rhodes Attorneys at Law. When she was a child she overcame shyness, and she became a good listener. Today she fully appreciates the importance of being a good listener. It is central to employee engagement, retention and productivity. What is not said is often more important that what is said. At the same time, she understands the importance of effective communications with employees. It is more than texts or e-mails. Effective communications is deeply rooted in the art of listening which requires these important elements: the elimination of distractions; the ability to read between the lines; eye contact; the ability to ask the right questions; showing respect; avoiding commentary or interjection; and matching the employee with the proper training and educational programs. It is important to recognize and express gratitude to employees. To move forward with employee engagement and aligned goals, it is important to think win win. Celebrate your joint and continued success. Say thank you as many ways as you can imagine is always a good idea. Employees cherish personal letters that recognize their accomplishments. These are a few of the things Patricia does to build effective employee relationships. Hold regular individual meetings for professional development. Establish recognition programs, wellness programs, health and relaxation techniques. Encourage employees to write attributes about others which contribute to the organization to be read publically. We are defined by who we are after we make a mistake. 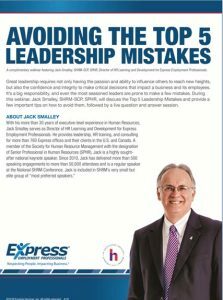 On this day, Jack addressed The Top 5 Leadership Mistakes. Do not assume that your best employees do not need recognition. According to Jack, your best employees need and deserve recognition. Employees and supervisors should be given credit where credit is due. Don’t accept mediocre performance from C employees. Lowering the bar for the C employees who make up about 50% of the workforce will not move the organization forward. Overloading the A performers who make up 20% of the workforce is not the answer. There is no such thing as a good employee with a bad attitude. Dictator Decision Makers will not improve the work environment. Referencing a famous quote by Sir Francis Bacon, Knowledge is power, Jack made the case for embracing people who think differently. He believes that great leaders know the value of maverick thinkers. Great leaders enable people to be different. Great leaders know how to communicate effectively. Employees need to know what is going on. An employee deserves honesty. When it comes to leadership, everything is on the table. The messenger is as important as the message especially when the message is bad news. The top communication mistake is not telling the truth. The failure to mentor employees is a critical mistake. In a compelling way, Jack used his own experience to demonstrate the importance of mentoring. His grandfather advised him to find something in life you enjoy. His father was his best friend. As a fire chief, he lived by these words: Don’t ask people to do things you are not willing to do yourself. When Jack was 12 years old, he admired the quarterback of the high school football team. Every Saturday, he would meet with Sammy Dugger who mentored Jack. This was a priceless experience. It enabled Jack to become a successful football player in his own right, and it documented virtually all of the characteristics of successful mentoring. Relationships matter. There is not a leader on earth who can succeed without employees sharing information. You must surround yourself with good people, and you must be credible. Avoid anonymity. At all cost, take a personal interest in people. Jack’s greatest mentor is his wife. She taught him the greatest lesson. Live family first. One of the marvelous things about community is that it enables us to welcome and help people in a way we couldn’t as individuals. When we pool our strength and share the work and responsibility, we can welcome many people, even those in deep distress, and perhaps help them find self-confidence and inner healing. You are the Face of America on its best day, and we are in your debt. Six years ago this month, Kitch and I visited Mount Rushmore. Affectionately known as the shrine of our democracy, it is an inspirational statement about America at its best. 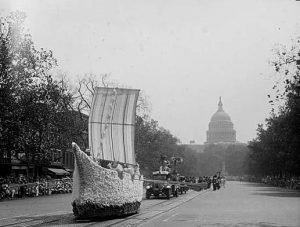 Conceptualized and designed by Danish-American Gutzon Borglum and finished under the supervision of his son, Lincoln Borglum, the project was 14 years in the making, 1927- 1941. It is a testimony to creativity, courage, dreams, enterprise, industry, hard work and perseverance. 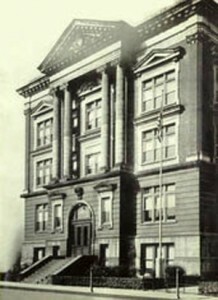 The actual construction began in 1935. Those in the know tell us that 400 men worked on the project. Some unskilled workers earned 50 cents an hour while other workers earned 65 cents an hour. Skilled drillers earned $1.25 an hour. The total cost of the project was 1 million dollars. Without the support of President Calvin Coolidge, the project would have never been completed. After his vacation visit to Mt. Rushmore, President Coolidge used his influence to get public funding through congress to finance the project. In 1936 when the project was half finished, President Franklin Roosevelt visited Mount Rushmore. 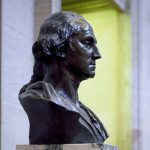 Looking at the images of Washington and Jefferson, he said the work was an example of cooperating with nature not fighting with nature. 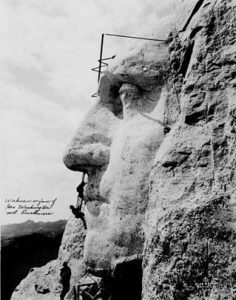 When the project was completed, 450,000 tons of granite rock had been dynamited and replaced with the images of George Washington, Thomas Jefferson, Theodore Roosevelt and Abraham Lincoln. Of the 400 men who worked on the project, only two men sustained minor injuries. 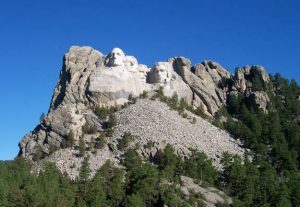 According to records of the National Park Service, 3 million people visit Mount Rushmore every year. In October of this year, the monument will be 75 years old. 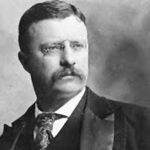 On this the 240th birthday of America, we thought it might be a good idea to share a few of the most encouraging thoughts authored by the four men who are enshrined on Mount Rushmore. The dogmas of the quiet past are inadequate to the stormy present. The occasion is piled high with difficulty, and we must rise — with the occasion. If I were to try to read, much less answer, all the attacks made on me, this shop might as well be closed for any other business. I do the very best I know how — the very best I can; and I mean to keep doing so until the end. If the end brings me out all right, what’s said against me won’t amount to anything. If the end brings me out wrong, ten angels swearing I was right would make no difference. On this special day, Kitch and I would like pay tribute to our fathers by sharing some of the important things they taught us. They taught us to work hard for the things we wanted. They encouraged us to dream big dreams. They made indelible marks on our souls. They were always there for us in all the ways that mattered. We both remember their words of wisdom…someday you will understand. We learned important lessons by watching how they dealt with problems. They taught us that sweat equity was the secret to success. We will never forget their words, "This will hurt me more than it hurts you." They taught us how to be responsible. Thank you for teaching us how to focus upon our present blessings, of which we have plenty; not on our past misfortunes of which the both of us have some. Our fathers were men of discipline, example, industry, hope, responsibility, sacrifice and love. We thank them for these priceless gifts. 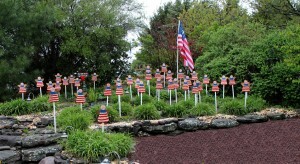 Memorial Day is much more than a 3-day weekend or the unofficial start of summer. It is a very important memory day. 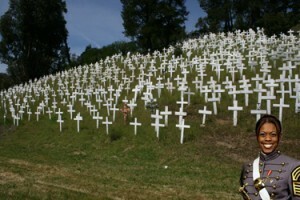 It is a day when we step back and remember that the price of freedom is not free. It is a day when we demonstrate our gratitude for the men and women who gave their lives to guarantee that all Americans can hold on to the things they love, the things they are and the things we never want to lose. During our Face of America journey, we had many magic moments that caused us to think about the essence of America and the contributions of genuine heroes. 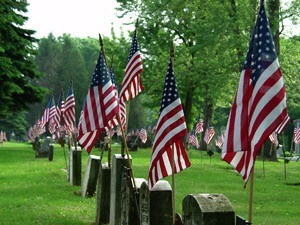 This is our attempt to summarize in words and images what Memorial Day means to us. There are 230,000 grave markers at Arlington. 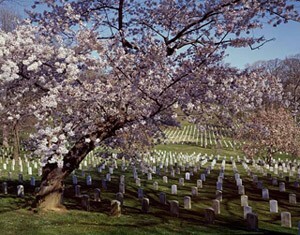 More than 400,000 people from the United States and 11 other countries are buried in Arlington National Cemetery. 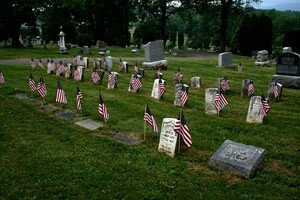 More than 4,000,000 people visit the cemetery every year, and 30 people are buried in the cemetery every day. The old Irish saying Death leaves a heartache no one can heal, love creates a memory no one can steal is a perfect description of the picture we received from Anthony Cutrano, the cofounder of the Middle East Conflict Wall Memorial in Marseilles, Illinois. It is a powerful image that needs no explanation. Built with voluntary contributions of money and labor, this memorial is unique in that it was built to honor the fallen before the conflict ended. Maya Angelou’s thoughtful comment How important it is for us to recognize and celebrate our heroes and she-roes! prompted us to include the name of one of our heroes, 2d Lt. Emily Perez, at the “Crosses of Lafayette” memorial in California. Emily Perez was the first member of West Point’s “Class of 9-11” to die in combat. She was 23-years-old when she lost her life while leading a convoy in Iraq. Joseph Campbell gave us a beautiful definition of a hero when he penned these 16 words. 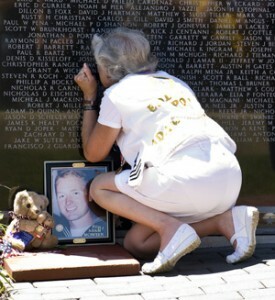 A hero is someone who has given his or her life to something bigger than oneself. 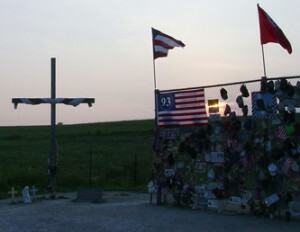 Campbell didn’t know it at the time, but he was articulating what thousands of people experienced when they visited the People’s Memorial to the heroes of Flight 93 in Shanksville, PA.
For 10 years, Shanksville was like a second home to us. The temporary memorial as it was known then was an inspirational place, a peaceful place and a memorable place. A young student described it perfectly with these unforgettable words. It is a place where Hope is stronger than death. To help visitors better understand what September 11th and Flight 93 was all about Eric Pierson designed the Angels of Freedom. On this Memorial Day, we would like to remember and thank five of those angels who were veterans: William Joseph Cashman, Patrick Joseph Driscoll, Andrew Sonny Garcia, First Officer LeRoy Homer and John Talignani. What made America great was her ability to transform her own dream into hope for all mankind. America did not tell the millions of men and women who came from every country in the world and who — with their hands, their intelligence and their heart — built the greatest nation in the world: ‘Come, and everything will be given to you.’ She said: Come, and the only limits to what you’ll be able to achieve will be your own courage and your own talent. Many years ago, Harold Ickes, a Pennsylvania native and Secretary of the Interior, asked himself a simple but profound question. What constitutes an American? Not color nor race nor religion. Not the pedigree of his family nor the place of his birth. Not the coincidence of his citizenship. Not his social status nor his bank account. Not his trade nor his profession. An American is one who loves justice and believes in the dignity of man. 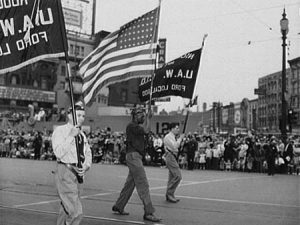 An American is one who will fight for his freedom and that of his neighbor. 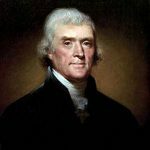 An American is one who will sacrifice property, ease and security in order that he and his children may retain the rights of free men. 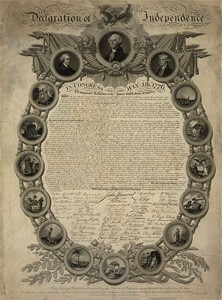 An American is one in whose heart is engraved the immortal second sentence of the Declaration of Independence. On this very special day, Kitch and I will be thinking about the men and women who were willing to give life to these words with their service and their sacrifice for America. We will never forget you. 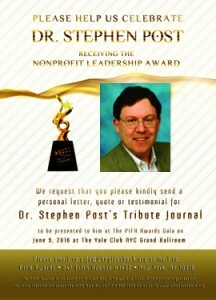 On June 9, 2016, Dr. Stephen Post will receive the Nonprofit Leadership Award from the Project Pay It Forward organization in New York City. To celebrate Dr. Post’s accomplishment, Kitch and I submitted this tribute for all that he has done to make our world a better place. Dr. Stephen Post has spent a lifetime researching, studying, teaching and writing about the power of good. Dr. Post is a good and decent human being. When we hear his name, five words come to mind: Altruism, Compassion, Happiness, Hope and Love. Dr. Post is the director of the Center for Medical Humanities, Compassionate Care and Bioethics. He is the president of the Institute for Research on Unlimited Love. More than anyone in our country, Dr. Post knows what the pursuit of happiness is all about. Our Face of America Journey took us to the Stony Brook University Medical Center for an interview with Dr. Stephen Post, the author of Why Good Things Happen to Good People and The Hidden Gifts of Helping. These are 15 things we learned about the power of good and the pursuit of happiness From Dr. Stephen Post. 1. Thinking about others, not just living for self, does make us happy. 2. 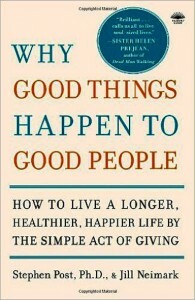 People who give generously, generally speaking, live happier, healthier and longer lives. 3. We Americans should always think of ourselves as teachers of caring for others. 4. 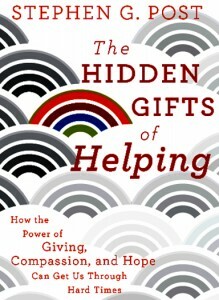 When people do “unto others” in kindness, it lights up the primitive part of the brain that also lets us experience joy. 5. In the giving of self lies the discovery of a deeper self. 6. People have more today, but we are not happier. 7. To be happy, Americans must learn when enough is enough. 8. The key to happiness is contributing to the lives of others, a simplistic thoughtfulness and moral integrity. 9. We need to learn more about how we can nurture the best in America: courage, faith, gratitude, hope, joy, love, nobility of purpose and wonder. 10. No matter how difficult life can be, never give up on the power of love. It is the one thing that can carry us through the difficult times. 11. Love people where you are, and do dig deep and meaningful roots. 12. Make it a practice to help one person every day. 13. The power of giving, compassion and hope can get us through hard times. 14. Helping someone who is hurting not only benefits those we assist, but it is good for us as well. 15. Love is not just a feeling to be hidden away in the heart and enjoyed privately. Love is something we show in everything we say and do; a witness to our families, our friends and the world. We must be on guard to prevent the love of power from overwhelming the power of love. America is one of the few countries on the planet that guarantees its citizens the right to pursue happiness. According to Dr. Post, give and you will be happy, give and you will be healthy, give and you will live longer, give and you will fulfill the promise of America. He believes that America is the land of the free and the home of the good. To paraphrase the words of Cleveland Amory, now more than ever we need a new kind of army – the army of Dr. Stephen Post. He is a classic example of the Face of America at its very best. 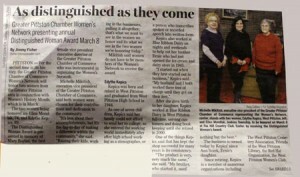 Pictures by Kitch Loftus-Mussari &Tony Mussari, Sr.
Our Face of America journey took us to the Arena in Wilkes-Barre Township to honor an invitation we received from a senior at Marywood University. A handwritten note on the inside of a formal invitation to Marywood University’s Ninety-Eighth Annual Conferring of Degrees touched our hearts in a very special way. The note was written by Abu Zahid, and it was addressed “To My Friends Tony & Kitch.” It read, in part, “I would love to see you on my graduation day.” The rest of the note was personal and private, and it will remain that way. 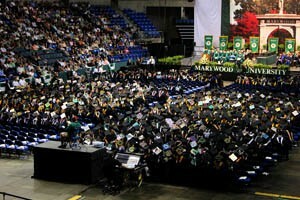 Needless to say, we accepted the invitation, and we designed a very special gift for the graduate. On Saturday, May 14, we drove to the Arena, and after we secured a parking place outside and a seat that would be easily accessible for Kitch inside, I returned to the area where the students were entering the building. 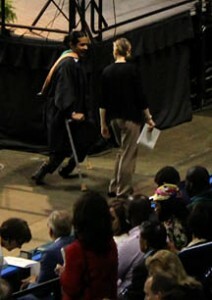 I wanted to make sure I saw Zahid before the graduation ceremony. This part of our plan worked out well. We met shortly after he arrived in the parking lot. We talked, and he introduced me to his friends he refers to as his American godmother and aunt, both of whom traveled long distances to be with him on his special day. Before and during the graduation ceremony, my mind was focused on two things: Kitch’s safety in this large crowd, and the compelling attributes of our friend Zahid. One of his biggest dreams would be realized on this day. 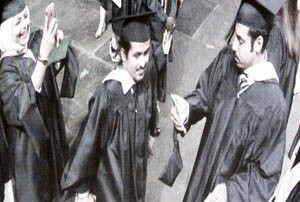 He wanted to come to America, and get a degree from an American university. Another goal was to learn to speak and write English fluently. He was so committed to this goal that he moved out of a comfortable home where he lived with three other Saudi students. He moved in with only English speaking students so he could learn the language. That speaks volumes about his character and his commitment to learning. When speakers made reference to Marywood’s core values, Zahid’s interaction with people gave witness to three of those values: Respect, Service and Excellence. He honors the uniqueness and dignity of every person he meets. He is committed to promoting social responsibility and he reaches up to attain the highest level of achievement. In another respect, he believes in empowerment. He wanted to get a good education so he could achieve his full potential. Zahid’s young life is deeply rooted in courage, honesty, gentleness, gratitude, responsibility, resolution, respect and love. Kitch and I were honored to be invited to his graduation. We are blessed by the memories of the moments we shared with him and his friends. We are inspired by his persistence, and we are humbled by his courage and determination to "keep on keeping on" regardless of the challenges and difficulties he encounters. 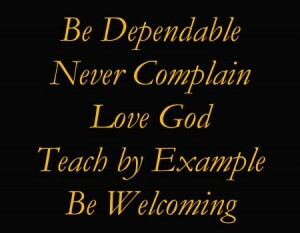 Every day of his life Abu Zahid is a living reminder of the power and wisdom of these words. Congratulations Zahid on your big day. Always know that you have a special place in our hearts. 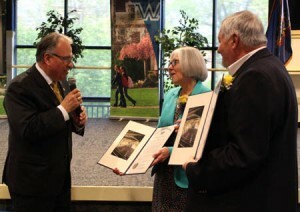 On an unseasonably cold and wet May afternoon, our Face of America journey took us to Wilkes University to celebrate the accomplishments of two of the finest teachers we have ever known, Drs. Robert and Judith Gardner. What follows here is the speech I wrote to honor the retirement of Judy and Bob. It includes one comment that was not included in the speech, because it arrived while the speech was being delivered. 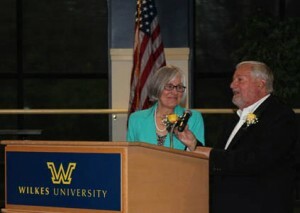 This is such a wonderful moment for Judy and Bob, a bittersweet moment for Wilkes University and a memorable community moment for those of us who have the good fortune to be here. I would like to begin with a thought for this very special day. 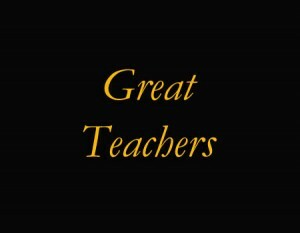 of a successful actor or musician, you have a portrait of a great teacher. Bob and Judy have that supreme art. Bob & Judy believe in their students. Good teachers possess a capacity for connectedness. They are able to weave a complex web of connections among themselves, their subjects, and their students so that students can learn to weave a world for themselves. The Gardners are great weavers. Bob & Judy have affected eternity! 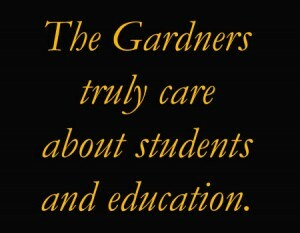 Giving students the wish to learn was the first priority in every class the Gardners taught. I have come to believe that a great teacher is a great artist… It might even be the greatest of the arts since the medium is the human mind and spirit. Kitch and I were blessed to observe the artistry of Bob and Judy Gardner. They are decent human beings. They are considerate, thoughtful and kind. They are polite people whose actions speak louder than words. For the past five years, Kitch and I have been privileged to work with Judy and Bob in their classroom and in their educational forum. 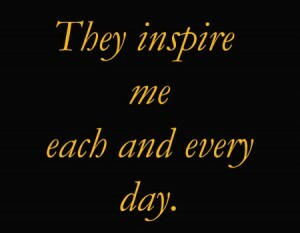 Because of their kindness, we have experienced many extraordinary and memorable teaching and learning moments here at Wilkes University. 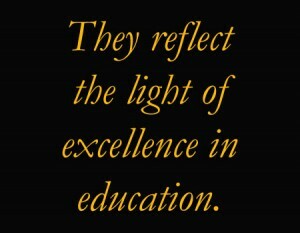 Judy and Bob Gardner reflect the light of excellence in education. They are warm, accessible, caring and competent. They set high standards for themselves and their students. Because of his musical background, Bob understands the observation of Dr. Richard Leblanc. In the classroom he is the conductor and the students are the orchestra. It is his job to bring out the best in every student. Your work on Earth… is to fill up in the lives of others those things they lack. In that you will find happiness. I came into Dr. Judith Gardner’s class as a 28-year-old college dropout… trying to make up for lost time… I leave it with a deeper understanding of, and caring for, education. It has been a very rare thing in my life to find someone whose mere passion for a subject inspires me to be passionate about it as well…. being in her presence you can feel the joy she gets from teaching her students. She is truly an inspiration to me and an individual I hope to someday be like. While I understand logically why she is retiring, I’d be lying if I didn’t say that it breaks my heart. She is a personal hero of mine, and if someday I can become a tenth of the teacher she is, I will be a great one. She may never know the depths of which she has inspired me, and other students as well, and it falls too short to simply thank her. However, in my making it one of my life goals to be like her, perhaps I can continue her legacy. I feel truly honored to have had Dr. Judith Gardner as one of my teachers, and I wish her, and her husband, all the health and happiness that they so justly deserve in their future endeavors. Thank you Dr. Gardner. Thank you for reminding me why I wanted to become a teacher. And thank you for raising my own personal standards of what to achieve and how to teach. Jason’s note says it all. I think every teacher in this room would agree. It doesn’t get much better than that. At just about the time I was speaking to Judy and Bob and their guests, another student was sending her thoughts to me via e-mail. Education is not the filling of the pail, but the lighting of a fire. Thank you Judy and Bob for your wonderful example. Thank you for opening your classroom to many different voices. Thank you for giving an old teacher a new classroom. Thank you for your priceless friendship. Impossible is just a degree of difficulty. May Providence bless your retirement with good health and good fortune, and may you always know of our admiration, respect, friendship and love. Always bear in mind that your own resolution to succeed is more important than any one thing. Abraham Lincoln. Thursday, April 7, was an unseasonably cold and rainy day. As we were leaving for our Face of America journey to the Marts Center on the Wilkes University campus, the rain stopped and the sun began to shine. We didn’t know it at the time, but this was a good omen of things to come. When we arrived at the Marts Center, the first three doors we checked were locked. We could not get into the building. Just as we were about to check the fourth door, three men, Ryan, John and Gene, approached the entrance. With a pleasant greeting, they showed us how to get into the building. Once inside, Ryan and John accompanied us to Room 214 where they rearranged the tables and chairs transforming the room into a comfortable classroom environment. These three men from the moving department represented Wilkes University with dignity and class. Kitch and I were very impressed by their attitude and their behavior. They reminded us of something Dave Kerpen, CEO of Likeable Local, wrote in Inc. Magazine: The difference between success and failure is a great team. Jennifer Baron is a very impressive student. She is working on a double major in English and Secondary Education, and a double minor in Women’s and Gender Studies and Special Education. She is a Resident Assistant, an E-Mentor, an Admissions Office Lead Ambassador, Vice President of UNICEF and Secretary of BACCHUS. Kitch and I met Jennifer last year in Dr. Judith Gardner’s Cultural Studies class. On this special afternoon, Jennifer arrived early to do an interview for The Beacon. When I asked her to help us set up the computer and the projector for our PowerPoint presentation, she pleasantly and willingly agreed to help. When all of the elements were working and the lights in the front of the room were dimmed, we went to the back of the room for the interview. Jennifer asked good questions. She modeled the technique employed by many successful journalists. She humanized the interview with her first question. “Tell me about your background.” Her style was soft and relaxed. There were no “Gotcha” questions. She empowered me to be reflective, and she listened attentively to my answers. It was a pleasure to work with Jennifer. Kitch and I are looking forward to reading her article. To rephrase a famous quotation, Jennifer conducted a successful interview because she was prepared, polite and patient. Just as Jennifer was finishing her interview, Drs. Judith and Robert Gardner walked into Room 214. As always they were welcoming and very personable. Judy and Bob are two very successful teachers. They love what they do, and they do it well. They are innovators. 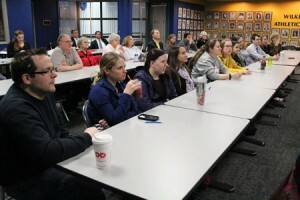 They started the Gardner Educational Forum Series at Wilkes, because they believe education should not be limited to the classroom. They want their students to hear other voices, because they believe those voices will enhance and expand the perspective of their students. In the classroom, they create a positive learning environment. They encourage discussion, and they provide incentives that encourage students to do more than take notes and memorize data. 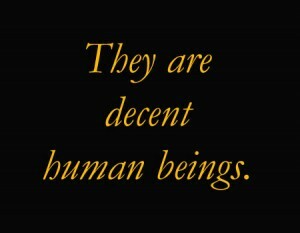 They are available, courteous, kind and respectful to everyone they meet. They don’t talk about teamwork, they exemplify it in everything they do. 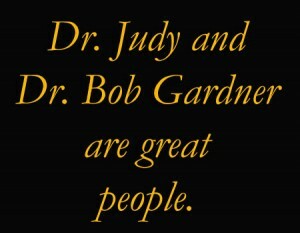 Because this would be the last time Judy and Bob would enter room 214 for a Gardner lecture as active members of the Wilkes University faculty, Kitch and I wanted to express our gratitude in a special way. 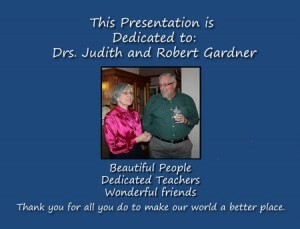 We dedicated the lecture to Judy & Bob, and we had the dedication slide printed and framed. It was the least we could do to express our thanks for their kindness to us. 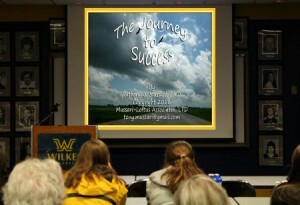 The short title for this presentation is The Journey to Success. The academic version of the title is Rules of the Road to Success: Life Lessons from Experience. I received the invitation to make the presentation in January, and despite cataract surgery and some health issues, I spent most of my time revising and refining the initial version of this presentation that was given at a Speed Networking Event at Marywood University in February of 2015. I will always be indebted to Matthew Parkyn for that teaching opportunity. The final edit to the Wilkes version was made on the morning of April 7. Yes, you are not seeing a typo. On the morning of the presentation, I was tweaking my presentation. The answer is very simple. 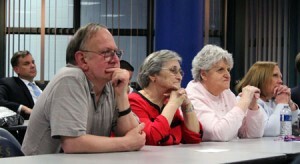 I did not want to disappoint Judy and Bob, their students and our friends who would be attending the presentation. Moreover, I feel deeply about this subject. It is something that is rarely discussed in a formal way in classrooms, and it is something that can be both emancipating and helpful to students. By the time my research was finished, I had assembled a Success folder on my desktop. It contained 601 files and 29 folders. It was one of three folders containing materials about success. The final version of the PowerPoint presentation had 128 slides with 144 pictures and graphics. 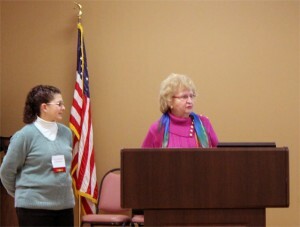 In addition to the dedication slide we presented to Judy and Bob, we presented a framed copy of Jennifer’s slide to her. Experiencing the joy of learning that was taking place, and knowing that the messages were resonating with the students and the adults. Before the event, I asked the students to record their definition of success on a 3X5 note card. My wife and I are working on an article about the event, and…I read your answer to the question, What Is Success? Based on the material you heard and saw in the presentation, would you modify your answer, and what would the modifications be? What are your thoughts about the presentation? This is the response I received from Jason Walker. Hello Dr. Mussari, I would change my answer to (Success is) living with integrity, being surrounded by the ones you love, and a sense of self accomplishment. I found the presentation to be very helpful and insightful. It has definitely helped me to evaluate my choices, decisions, and values. Thank you for giving the presentation. Those four sentences contained the best definition of a successful classroom experience a teacher could ever expect. Jason came into the room with one idea. 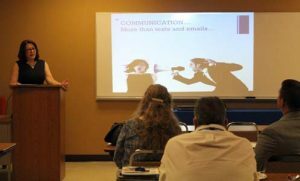 He participated in every aspect of the presentation, and he left the room with a different and more refined understanding of the subject matter. What a moment. It doesn’t get much better than that. An adaptation of the words of Peter F. Drucker says it all: No one learns as much about a subject as the person who is asked to teach it. If you want to be successful, it’s just this simple. Know what you are doing. Love what you are doing, and believe in what you are doing. Kitch and I know that we love to help Judy & Bob Gardner and their students because we believe in what they are doing as teachers and friends. Thank you, Ryan, Gene and John. Thank you, Judy & Bob Gardner. Thank you, John Augustine and Mark Simko. Thank you, Bev, Darlene and Ellen. It was one of the most enjoyable and successful learning experiences Kitch and I have ever had, and we will treasure the moments we spent with you. 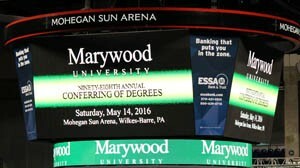 On March 21st our Face of America journey took us to Marywood University for the 14th Annual Conference on Ethics, Leadership and Corporate Social Responsibility. 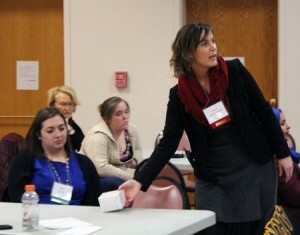 The theme of the conference was Multiple Perspectives. 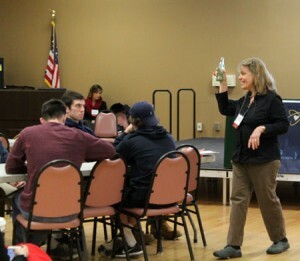 In keeping with the tradition of the Ethics Conference, it was an experience in community and critical thinking. It was a wonderful, information-packed learning experience for everyone who attended. The featured speakers included James Sheridan, Pennsylvania American Water, Dr. Ahmed Gomaa, School of Business and Global Innovation, Marywood University, Dr. Christiana Hasemann, NY-Penn Nutritional Services, Inc., Dr. Murray Pyle and Dr. Rex Dumdum, School of Business and Global Innovation, Marywood University, Michael Williamson and Marygrace Wilce, Prudential Insurance and Annette Fisher and Leslie Christianson, Marywood University. 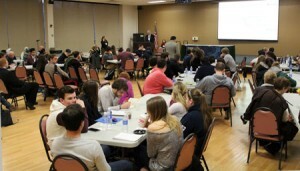 There were two student presentations: Student Perspectives on Ethics as recorded in posters students designed and a Business Case Study presented by the award winning Marywood University Student Ethics Competition Team. 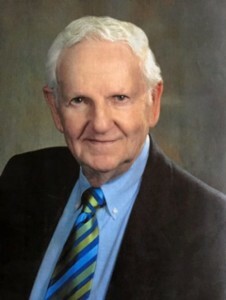 The conference was organized by Dr. Murray Pyle, his wife Ellen Sherwood and Dr. Monica Law. They had help from members of the Marywood community. When we arrived at the conference, Dr. Ahmed Gomaa was discussing Ethics in an IT Environment. The slide on the screen outlined a history of ethical problems from the 1940s/50s to the problems we face today, security and secrecy, propaganda, and identity theft. At one point in his presentation, Dr. Gomaa got everyone’s attention when he spoke these five words, “Privacy doesn’t exist anymore.” Rapidly declining data storage costs lower the cost of creating huge national databases comprised of private information. There are some real-world IT ethical dilemmas like the use of systems to monitor employee e-mail to protect valuable assets, but decreasing employee privacy and monitoring employee use of the Internet at work decreasing employee privacy. He addressed the moral implications of this problem and the need to develop guidelines to protect a person’s right to privacy. During the question and answer session, Dr. Gomaa made it very clear that there is no absolute right to privacy. Using the current conflict between the U.S. Government and Apple regarding the encryption issue, Dr. Gomaa told the audience, no one is above the law. If a judge offers a ruling that the encryption must be broken, this decision must be respected. 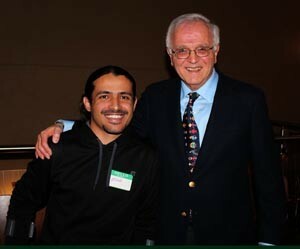 During the intermission, I had the pleasure of meeting a very personable student, Tom Skrutski. 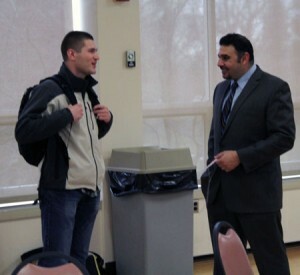 I asked him if he agreed with Dr. Gomaa’s position about the encryption issue. Without hesitation, he said he did. When our security is at stake, he told me, no one is above the law. It was a special moment when Dr. Alice E. McDonnell, author of Managing Geriatric Health Care Issues, introduced Dr. Christiana Hasemann, a registered dietitian and President/CEO of NY-Penn Nutrition Services, Inc. Christiana was a student of Dr. McDonnell, and she is justifiably proud of Christiana’s many accomplishments in the health care field. 5. What should drive healthcare decisions: Quality or Efficiency? 6. Some of the most challenging ethical issues involve the cost of care for the elderly, care for the mentally ill or cognitively impaired. Not all questions will have answers in ethical dilemmas. 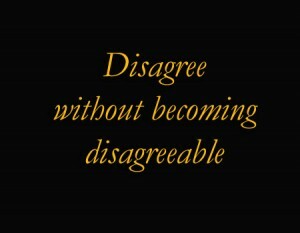 The hope is that through careful thought, discussion and deliberation, questions and answers will intersect for an outcome that is ethically sound! What is organizational culture, where does it come from and how does it relate to ethics, corporate social responsibility and leadership? He explained that many things contribute to culture: family, religion, language, social networks. The basis of culture is shared values. Drawing from the work of Edgar Schein, Dr. Pyle explained organizational culture as a pattern of shared basic assumptions learned by a group as it solves its problems. 3. Assumptions-The root of culture…the hidden or unspoken behaviors of people in the organization. Dr. Pyle made an important point when he emphasized that the espoused values and the lived values are often not the same. Effective leaders make sure this does not happen. 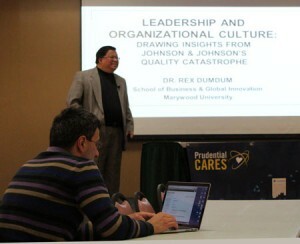 Dr. Pyle’s colleague, Dr. Rex Dumdum, drew insights about leadership and cultural organization from a very famous Harvard Case Study about Johnson & Johnson. Quoting Edward Schein, Dr. Dumdum made the point that leaders create, build, maintain and change the culture. There was a time when Johnson & Johnson had a sterling reputation. In 2010, a congressional investigation of the company raised questions about its integrity. It painted a picture of a company that is deceptive, dishonest and risks the health of many people. In 1982, Johnson & Johnson’s CEO emphasized quality not quantity. Almost a generation later in 2009, the CEO expected employees at Johnson & Johnson to do their job fast. They were encouraged to make it look good, and get it done as fast as possible. Management pressured workers to take shortcuts. The dominant force in the company was profit not quality. Marketing had a higher priority than science. The result of this culture is recorded in this statistic. Between 2008 and 2011, there were more than 50 voluntary recalls. Ethics is what you do when no one is looking. 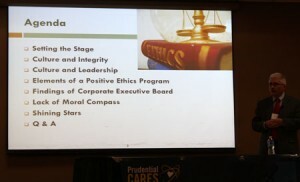 Then he introduced Michael Williamson and Marygrace Wilce to explain why Prudential takes ethics very seriously. Really good companies practice what they preach. That is what we do at Prudential. We tell our employees that we one company with one brand and one reputation. We respect the Buffett rule: It takes 20 years to build a reputation and 5 minutes to ruin it. If you think about that, you’ll do things differently. The Prudential code of conduct is 109 pages long. It is deeply rooted in honesty, forthrightness, and using good judgment. Culture trumps compliance every time. It’s not about getting results. It’s about how you get results. Strong Ethics equals good business results. A good ethical culture results in less employee misconduct and higher productivity. 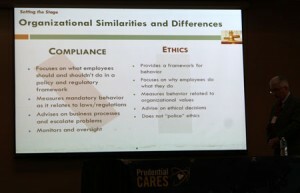 Prudential encourages and trains its employees to win with integrity. Successful leaders are good role models. Integrity drives brand. Brand drives profit. Create a “safe to say” environment where associates feel safe to raise their hand when there is a problem. Rationalization is a deadly sin. Academic Integrity: What Does It Really Means and Why Do you Need to Know? The final session of the conference was conducted by two librarians from Marywood, Annette M. Fisher and Leslie Worrel Christianson. Annette is the Information Literacy librarian. Leslie is User Services librarian. Using various items including Goodnight Moon, a Barbie doll and a Coke bottle, Annette defined copyright, plagiarism and patent. 2. It must be an expression of an idea fixed in a tangible medium. In 1998, the Sonny Bono Copyright Term Extension Act lengthened copyrights to the life of the owner plus 70 years. The heirs of the person who copyrighted the material own the copyright for 70 years after the author’s death. If the copyright is not renewed, it goes into Public Domain. Trademarks must be registered every 10 years, and patents every 20 years. Coca-Cola is an example of all three: Copyright, Patent and Trademark. Annette made it very clear that academic dishonesty is claiming someone else’s work as your own. You have a greater role and responsibility in creating new knowledge, in understanding the contours and the challenging dynamic of the world of information, and in using information, data, and scholarship ethically. Leslie dedicated her time to what she called the moral code of academia…Academic Integrity. 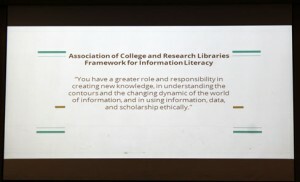 Everything in her presentation was designed to emphasize how a student or teacher could use information ethically, because in our information society, information has become the central and most significant commodity. In our information-knowledge based culture, it is more important than ever to use information ethically. What is your knowledge product? What is its value to society (Economic, Social, Political Influence)? How can it negatively impact society? Before we left the Nazareth Student Center, we stopped to talk with the students who helped to make the conference a success. They greeted everyone who attended the event. They worked at the registration desk answering questions and providing directions. They were welcoming, pleasant and very helpful. It was a long day for them, but they were as enthusiastic at this late hour as they were when we arrived. When I asked for their cooperation so that I could get a group picture, they did not hesitate to respond positively to my request. They did not realize it at the time, but they and their behavior reflected the light of one of the things the ethics conference is all about. They demonstrated respect for themselves and respect for others. Watching these students throughout the day gave truth to the axiom Actions speak louder than words. I am sure your inbox is filled with congratulatory notes so I will make this one short and to the point. You and your colleagues have every right to be walking on Cloud 9 this morning. 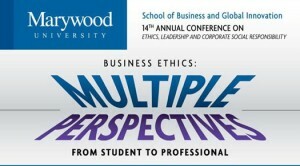 The Ethics Conference was a wonderful, information packed learning experience for everyone who attended. Kitch and I enjoyed the sessions we attended. Thank you for all that you did to make the conference a success, and thank you for your kind invitation. Kitch and I hope to write something about our experience. I will let you know when our article is finished. Have a peaceful and enjoyable day on Cloud 9! Graphics by Tony Mussari, Sr.
Our Face of America journey took us to Temple Israel in Wilkes-Barre for the memorial service honoring our friend Atty. Joe Savitz. Conducted by Rabbi Larry Kaplan, he described this memorable and dignified service as an opportunity to give comfort to Joe’s children. It enabled family members, colleagues and friends to paint a picture of a man whose life and work reflected the light of America at its very best. 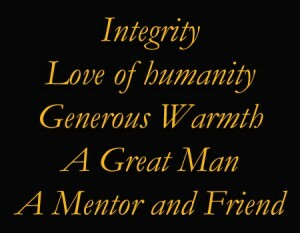 This is a summary of the characteristics the speakers attributed to Joe Savitz, the cousin, father, colleague, attorney, community leader and friend. Joe’s cousin described him as a remarkable man. It was always fun to be with him, he said. He was a man of humility who took joy in the accomplishments of his family and his friends. The most poignant moment of the service occurred when Joe’s son Marc talked about his father in heartfelt and compelling ways. In 1962 when he was 8-years old, he witnessed the beginning of a true love story between two love birds, his mother, Janice, and her second husband, Joe Savitz. These are some of the values Marc learned from Joe: never complain, be dependable, provide your children with a good home and great memories. 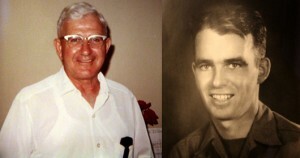 As he grew older, he learned that Joe’s love of God shaped his character. His life was all about us and God. He wanted people to live the most rewarding life possible. He taught us by example to apologize for hurtful words, and to always be welcoming to people you meet. In a touching way, Marc mentioned the personal way Joe included him and his sister, Lynne, in the activities of the larger Savitz family and how Joe always stayed on top of developments with the family giving encouragement and praise to the members of his family. 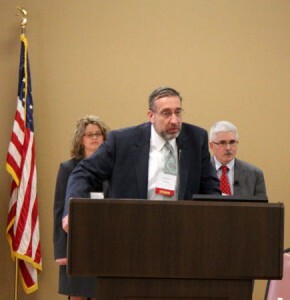 Gene Roth talked about Joe Savitz the preceptor, mentor, advisor and friend. 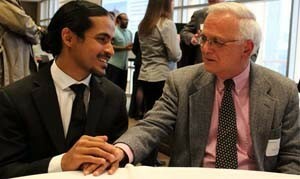 He emphasized his definition of a good lawyer and his penchant for writing letters of encouragement. For Joe Savitz, it was not about the law, but how one practiced the law. 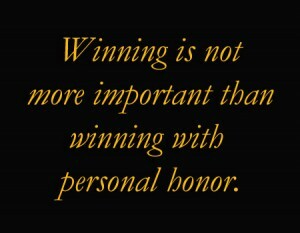 It was all about being respectful, disagreeing without becoming disagreeable, and his cardinal rule: winning is not more important than winning with personal honor. Atty. 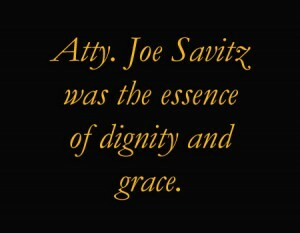 Joe Savitz was an outstanding lawyer who was well respected in the courthouse and in the community. He was a man of honor. He was understanding and welcoming. His positive attitude was inspiring. For Atty. Roth his friend was the sweetest and kindest gentleman he had ever known. What I am suggesting is that each of us turn from the negativism that permeates our society and look for the remarkable good among those with whom we associate, that we speak of one another’s virtues more than we speak of one another’s faults, that optimism replace pessimism, that our faith exceed our fears. When I was a young man and was prone to speak critically, my father would say: “Cynics do not contribute, skeptics do not create, doubters do not achieve. Atty. Craig Blakeley drove from Virginia to attend the memorial service. When he addressed the congregation, he drew upon more than 30 years of friendship with Joe Savitz. That friendship began when Atty. Blakeley was a law clerk to Judge Max Rosenn. His admiration and respect for the Judge motivated him to work with Joe Savitz, as well as his co-clerks Richard Gelfond and Jeff Goldsmith, and Judge Rosenn’s brother Harold, to establish the Max Rosenn Lecture Series at Wilkes University. Following the example of both Judge Rosenn and his first law clerk Joe Savitz, Craig Blakeley allocated much of his time to reading testimonials he received from former Rosenn law clerks. Dr. Mollie Marti wrote about Joe Savitz’s love of humanity and his generous warmth and about one of Joe’s first cases, in which he represented his mentor, Judge Max Rosenn, then a senior partner with Rosenn, Jenkins and Greenwald. Before Atty. Craig Blakeley ended his remarks, he spoke with humility and emotion about Joe Savitz’s intelligence, wisdom, generosity and compassion. As tears filled his eyes, he shared this final thought. Joe Savitz was a good man, a good friend and I will miss him very much. Dr. Patrick Leahy is the sixth president of Wilkes University. Appointed in 2012, he has had only 5 or 6 meetings with Joe Savitz. In 2014, he had the honor of presenting Joe Savitz with the first President’s Medal for his 36 years of service on the Board of Directors and a lifetime of support and good counsel to his alma mater. 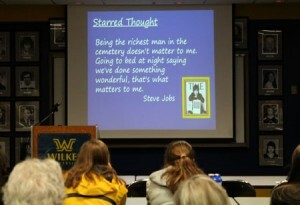 While Dr. Leahy was speaking about Joe’s accomplishments, I was thinking about the words of John Wesley. 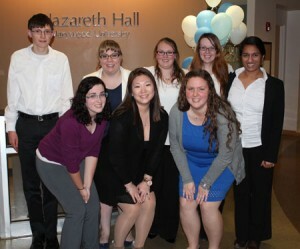 They are a perfect description of Joe’s service to Wilkes and his community. One of Joe’s cousins who had the privilege of knowing him for 72 years described him in words: patient, deliberate, loving, supportive, encouraging, mindful, generous, thoughtful and service. He kept us on our toes. 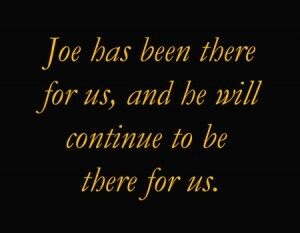 According to Rabbi Kaplan, Joe has been there for us and he will continue to be there for us. 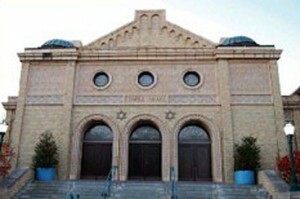 Kitch and I entered the sanctuary at Temple Israel with heavy hearts. We left the sanctuary with a firm belief that our friend had returned to his God, and he was at peace. We will miss this great man and all that he did to help so many people. To paraphrase the words of Fred Rogers, Joe Savitz gave everyone he met a great and priceless gift, the gift of his honest, kind, generous, encouraging, compassionate, and thoughtful self. God bless you, Joe, and may He send his healing grace to your family and all the people who were touched by your kindness. Ellen Mondlak is a friend, an inspiration and a woman who works tirelessly to serve her community. Ellen and I met 61 years ago at St. Mary’s High School in Wilkes-Barre. That friendship was rooted in the culture of the 1950’s. 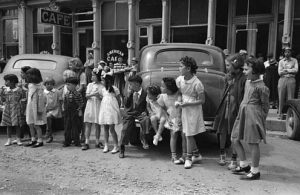 We had great fun at the weekly dances at St. John’s School in North End and the dances at the Catholic Youth Center in Wilkes-Barre. Ellen was a cheerleader, and a respected and popular member of our class. 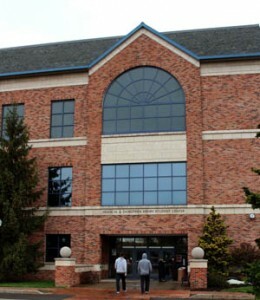 After high school she attended College Misericordia. She became a teacher. She left the classroom to become a part of the management team of her father-in-law’s printing business with her husband Jerry. Ellen was the bookkeeper, and the customer service representative. She also did layout and typesetting. 4. Sponsoring a little league team and a college league team. She also volunteered her services at St. Mark’s Church Altar and Rosary Society and the Jenkins Township American Legion. 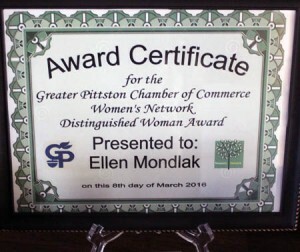 Earlier this month, the Greater Pittston Chamber of Commerce Women’s Network presented Ellen and one of her friends, Edythe Kepics, with its Distinguished Woman Award. It’s less about their accomplishments, but it’s the day-to-day of making a difference within the community. Raising their kids, working in the business; pulling it all together that’s what we want to see in the women we honor, and that’s what we see in the two women we’re honoring today. 5. 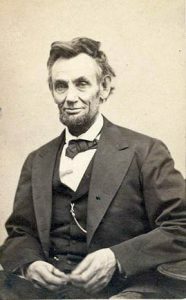 Former president and member of the Pittston Library. Someone once said, if what want to know who a person is, pay close attention to what is in their home. During a recent visit with Ellen and Jerry, I did just that. This is what I discovered. Ellen’s life is centered in her family. Wherever you look you see pictures of children, grandchildren and special pictures of family moments. 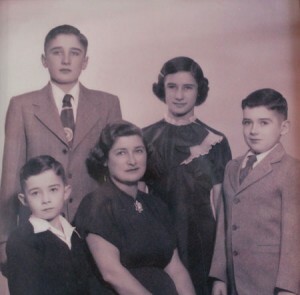 Two on my favorites are the pictures of Ellen with her three brothers and her mother. It captures both the ecstasy of a teenager with dreams, and sadness of her father’s premature death. The other picture that defines Ellen is the image she put on the wake-up screen of her computer. 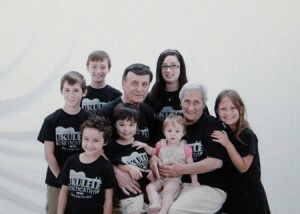 It records a very special moment with her husband and her seven grandchildren. Ellen loves angels. In just about every room on the first floor of her home one will find an image of an angel. She has adorned two of these angels with signs that speak to her value system. 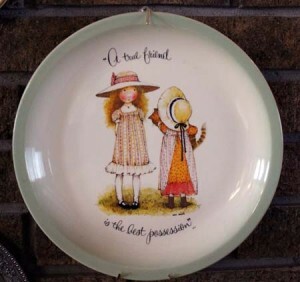 True friendship is a blessing. 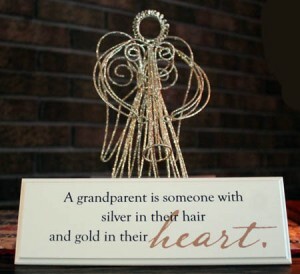 A grandparent is someone with silver in their hair and gold in their heart. Ellen is surrounded by angels, and her heart is filled with love. Her service to others grows out of that love, and it has kept her moving forward since the day we met in 1955. She has known moments of great joy, and she has experienced the devastating loss of her son. She is most deserving of the Distinguished Woman Award. Congratulations, dear friend. Thank you for all that you do to make our community a better place to live, work and raise a family. Thank you for being a caring friend and an example of what we all should be. You are a radiant Face of America on its best day, and we are in your debt. 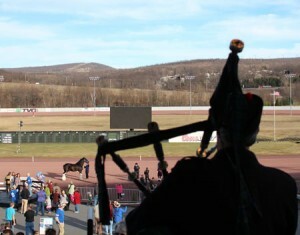 On a pleasant March afternoon, Kitch and I traveled to Mohegan Sun at Pocono Downs where we had the good fortune to participate in a wonderful event featuring the World Champion Express Clydesdales. In one respect we experienced a celebration of the grace and beauty of these magnificent horses. In another respect, we were drawn into a world of Irish culture that was joyful and heartwarming. Hosted by Amy Clegg and Jeff Doran the event was designed to raise money for the Children’s Miracle Network operated by the Geisinger Medical Center in Danville, Pennsylvania. 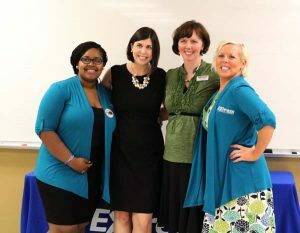 Amy owns and operates the Express Employment Professionals franchise in Scranton. Jeff is her counterpart. His Express office is located in Wilkes-Barre. 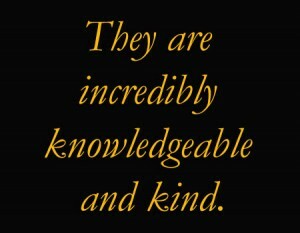 Amy and Jeff are excellent representatives of their company, and they reflect the light of compassion, kindness and professionalism in everything they do. 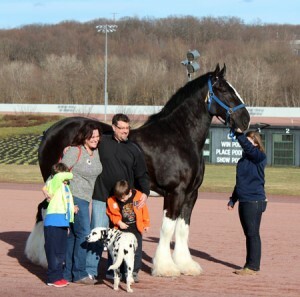 Those values and so many more were at the core of events that brought happiness and joy to everyone who attended the second visit of the Express Clydesdales to our little corner of the world. If you doubt the accuracy of that statement please look closely at the faces of the children and the adults in the pictures in our article. This is our attempt to recreate the most memorable moments of this very special afternoon. 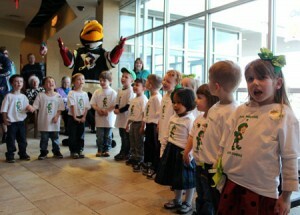 At about 3:30 p.m., a group of children from the Small Wonders Learning Center in North Scranton faced an adoring crowd of parents, grandparents, friends, relatives and Tux, the Wilkes-Barre Scranton Penguins mascot, as they sang several songs with energy and enthusiasm. Included in their repertoire were these favorites: Zip-a-Dee-Doo-Dah, Lucky Leprechaun and Grand Old Flag. According to those who study Irish history, bagpipers were a significant part of ancient Irish society dating back to 35 B.C. To this day, the distinctive music of the bagpiper is central to Ireland and Irish culture. According to some historians, it is more popular around the world than ever. 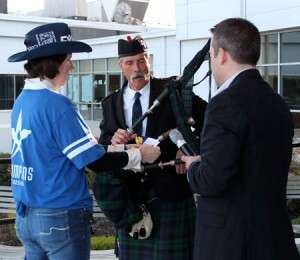 In putting together the program for the Clydesdales visit, Jeff Doran made sure a bagpiper would be there to entertain the guests, and that’s exactly what his friend Jim Sweeney did. Standing at the top of the stairs overlooking the racetrack and the Clydesdales adoring fans, he captivated everyone with the glorious sounds of his music. While listening to Jim Sweeney, one thing became obvious. If you want to hear the spirit of the Celtic soul, listen to the bagpipes. 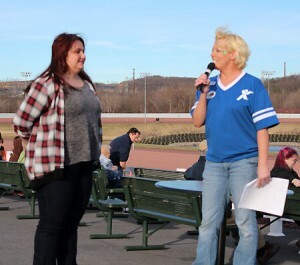 When Jim Sweeney finished his performance, Nikki Schake, Director of Community Engagement for Express Employment Professionals in Scranton, introduced Mary Scheller. Mary is well known to people who have heard her perform. She has a unique talent that enables her to personalize the words of our National Anthem in a way that reinforces the larger meaning of who we are as a people and what makes our country unique. 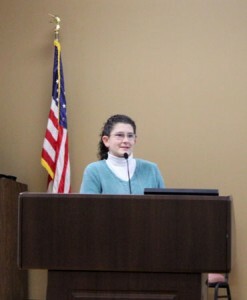 Joanna Bowser is the Coordinator of the Children’s Miracle Network. 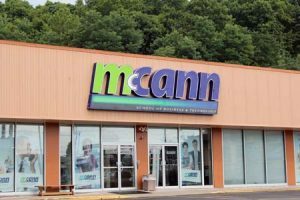 She told her audience that all of the money raised by her organization stays in Northeastern Pennsylvania. 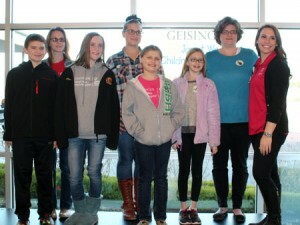 She thanked the members of the Express family for their support, and then she introduced children and their parents who received life saving care in Geisinger programs. A 15-year old girl name Kaitlin described her battle with cystic fibrosis and juvenile diabetes. Peyton was 8-years old when she was in an automobile accident. She sustained life threatening injuries. The help and care she received saved her life. Ashland was 8-years old when she sustained head injuries that necessitated brain and eye surgery. Someone once said: The best things in life are not things, they are moments. Listening to the poignant stories told by these genuine heroes was one of those moments. A good part of the final hour of the event was dedicated to picking and announcing the winners of the various items that were part of the raffle. 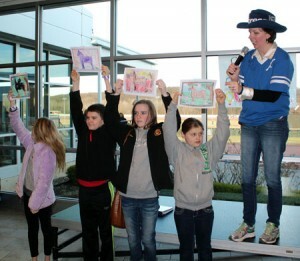 Before that happened, Amy Clegg took great delight in presenting the winners of the coloring contest. With exuberance and pride, the four youngsters who won this contest held their images high above their heads so everyone in the room could see their creations. Jeff Doran joined Amy in the front of the room when the 20 raffle winners were picked. One by one they came to the front of the room to claim their prize. The most coveted prizes were the bicycles donated by the Walmart Supercenter in Dickson City. The Irish have a saying: Dance with your heart and your feet will follow. That’s exactly what the students from the Crossmolina School of Dance did at the Clydesdales event. All decked out in their colorful costumes, they performed to the lilting sounds of Celtic music. They were delightful to watch, and very entertaining. Under the watchful eye of their instructor Maureen Murphy King, the dancers exuded high spirit and confidence. There is another Irish saying: Your feet will bring you to where your heart is. 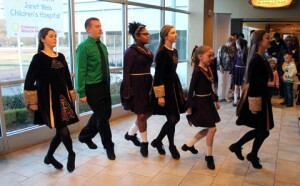 The performance of the Irish step dancers touched the hearts of everyone who saw them perform. One of the most anticipated events of the afternoon happened shortly before 6 p.m. 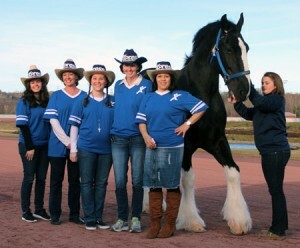 The Miss Express Clydesdales Queen is all about promoting entrepreneurship. leadership and mentoring opportunities for young women. 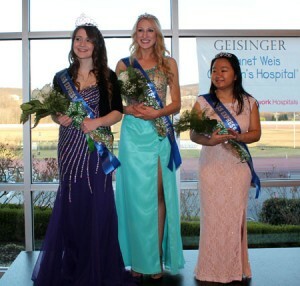 Three young women were selected as finalists in the first competition of its kind in the history of the company: Kady Hodge, a senior at Tunkhannock High School, Grace Penney, a senior at Crestwood High School and Rachel Jones, a junior at Holy Redeemer High School in Wilkes-Barre. During the Clydesdales event they were judged as they mingled in the crowd greeting people and handing out lollypops and stickers. They also helped with other chores. 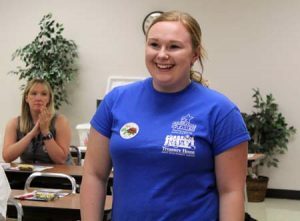 When the votes were tallied, Rachel Jones was 2nd runner up, Grace Penney was 1st runner up, and Kady Hodge was the first young woman to earn the title of Miss Express Clydesdales. She won a thousand dollar scholarship to the college of her choice. Grace Penney won a five hundred dollar scholarship, and Rachel Jones received a basket of goodies and gift cards. Throughout the entire afternoon, all three of these contestants presented themselves with great dignity, discipline and class. 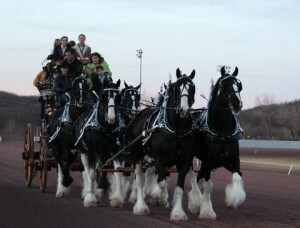 With broad smiles on their faces, they walked to the track where the Clydesdales were waiting to take them on a 20 minute ride around the track. 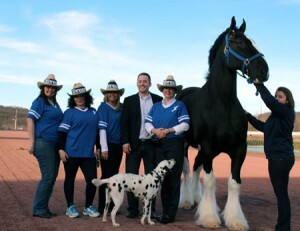 Early in the afternoon,while people were standing in line waiting to have their picture taken with a Clydesdale, I had a very interesting conversation the Mike Hoehner, Special Events Marketing Manager for the Express Clydesdales. During our conversation, I asked Mike to define success. He also told me he believed that successful people are servant leaders. They use their authority to serve others. Successful leaders have a good mentor. 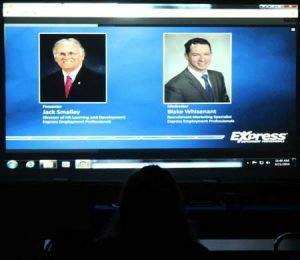 Mike’s mentor is Jack Smalley, one of the most respected members of the Express leadership team. 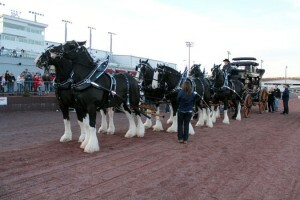 As I watched the six Clydesdales pull the Express coach around the track, I thought about Mike Hoehner’s words, and I looked beyond the obvious. Yes, this was a fundraising event. Yes, this was a community outreach event. Yes, it was an entertainment event. But in my heart and mind, it was much more. It was an example of many of the values that make America great: belonging, caring, compassion, creativity, community, discipline, excellence, empathy, gratitude, industry, kindness, responsibility, thoughtfulness, understanding, and opportunity. Amy Clegg and Jeff Doran personify the principles of servant leadership. They encourage, empower and help the people who work with them. They heal wounds and restore relationships. They bring people together. They value the relationships they have with Lee, Jocelyn, Kari, Mary, Nikki, Kathleen, Samantha, Holly and Vivian, and they treat them with respect. They appreciate the volunteers who helped to make this special afternoon so successful. What Kitch and I saw on Friday afternoon can only be described as Express at its best and a beautiful community moment which exemplified America at its best. Thank you photographers Danielle Antonello, Julie Overholser and Warren Ruda and artist Diane Grant Czajkowski. It was a joy to work with you. Photographs by, Tony Mussari Sr. 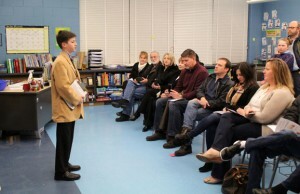 Shortly before 7 p.m., we entered the school in Cranbury, New Jersey. The hallways were jammed with parents and friends of the 68 seventh-grade students who would make presentations in the 2016 Wax Museum. The sense of anticipation was exhilarating. The feeling of accomplishment was apparent to every one of the visitors, as was the commitment of time, energy and effort made by teachers, students and their parents. The Cranbury School has received national recognition for excellence in the classroom, and this creative approach to living history is an extension of that tradition. Each of the students was required to pick an historical figure from an approved list of men and women. Some students like Adam MacMillian decided to pick their own individual and convince their teacher of the worthiness of this person’s contribution to history or culture. Adam chose the legendary hockey coach Herb Brooks. When we entered Room 60, we were impressed by the behavior of the students, and the creativity exhibited in their posters and their costumes. One would never expect to find Maya Angelou, John Adams, Larry Page, Eleanor Roosevelt, Glen Miller, Jane Goodall, Gordie Howe, Thomas Edison, Herb Brooks, Mahatma Gandhi and James Beard sitting next to one another in the front of the room. At the appointed time the presentations began. 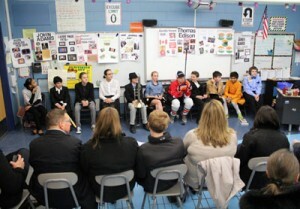 Each student faced the audience and spoke without notes for about two minutes. Oh hello there, I’m Herb Brooks, ice hockey player and coach. You may know me as the coach who won gold in the 1980 Olympics. But you should also know me as a coach that changed the game, not just my teams. He emphasized the importance of Coach Brook’s relationship with his brother Danny and his college hockey coach John Mariucci. Adam told the audience that Herb Brooks worked hard and followed his dream. He maintained high standards for himself and his players, both in the Olympics and in the NHL. During his disciplined presentation, Adam maintained eye contact with everyone in the room including his parents and his grandfather. They were sitting in the front row. Well, I have a practice right now, so here is my friend Mahatma Gandhi. He returned to his seat in the front of the room. 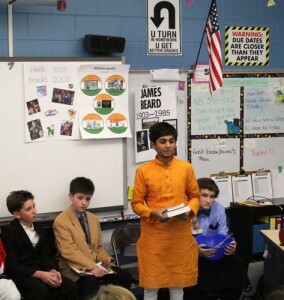 During the final two speeches, I took a few pictures, and I thought about the benefits of the Wax Museum experience. 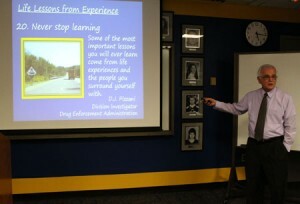 It gave the students an opportunity to learn something about critical thinking and the importance of research. It gave them an opportunity to craft a story in words and images. It challenged them to make several presentations in front of different audiences. It compelled them to have the discipline to condense their story into a very tight window. It created an environment which empowered the students to learn how to learn. Adam’s written presentation was exactly 361 words. He told the story of Herb Brook’s life and his accomplishments in about three minutes. Adam did not use any digital devices during his presentation. It was all about the person, the narrative, the research and the delivery. 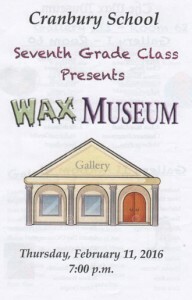 In my opinion, the Wax Museum was an extraordinary opportunity for students to learn important skills that will help them during every stage of their development. 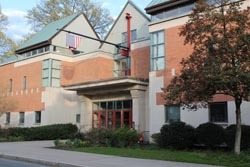 In the 1980’s, Carol Malouf, former school administrator, set the bar high for the students in the Cranbury school system when she initiated this unique learning experience that was deeply rooted in historical biography. 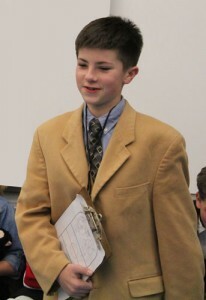 Almost a generation later, the Wax Museum tradition continues in the Cranbury school system. The students, their parents and their teachers continue to respond in ways that represent American public education at its very best. As I was leaving the school I noticed artwork on a classroom door that defined American education and our country at its very best. Thank You Chivon and Doug, for inviting us to attend this wonderful event. Thank you to the 68 students for your thoughtful and informative presentations. Thank you Adam for remembering the legacy of Coach Herb Brooks and presenting it in a very effective way. Thank you Elizabeth Grimaldi for the time, effort and energy you invested in organizing this extraordinary learning experience. 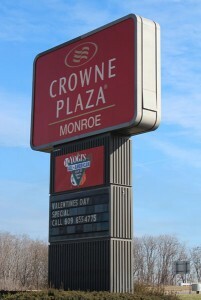 On a bitter cold February afternoon, Kitch and I made our way to the Crowne Plaza Hotel in Monroe Township, New Jersey. It was the first stop on our journey to the Wax Museum presented by members of the seventh grade class of the School in Cranbury, New Jersey. Shortly after we arrived at the hotel I realized that I forgot my baby aspirins. I asked the woman at the reception desk, if I could purchase a bottle of baby aspirins in a vending machine. Her answer was negative. At this point in our conversation Lorna Wright walked into the reception area. She quickly picked up on our conversation. When I explained the importance of baby aspirins to a recovering heart surgery patient, she took the initiative, and volunteered to help. She walked with me to the area where the vending machines are located. After carefully checking the inventory, she made this suggestion. I will see to it that you get a bottle of baby aspirins. There was one complication. It was 4:30 and our hosts Adam MacMillan and his father, Doug, agreed to meet us in the lobby at 5 p.m. We would drive to a local Italian restaurant where Adam’s mother, Chivon, would meet us. I expressed my gratitude for her kindness and her willingness to help. Less than 20 minutes later, Kitch and I were standing in the lobby exchanging hugs with Adam and Doug when the office door opened and Lorna Wright appeared carrying a small white bag. At that point in our conversation, I mentioned my life-long interest in learning about and teaching the principles of customer service. I asked her what her definition of customer service is. Later in the evening, I asked Doug and Chivon to share their definitions of customer service. If you have read our blog, you know that we have visited every one of the continental United States searching for examples of the Face of America on its best day. Without question, Lorna Wright is a classic example of America it its best. She is caring, helpful, and kind. She looks beyond the obvious to solve problems. She takes the initiative to find answers to problems. She listens intently, and she is not dismissive or contentious. She is empathetic. She has that priceless quality that makes you believe that she cares about you. Kitch and I will never forget her kind and welcoming way, and we will try in every way we can to reach her standard of excellence.